It’s been just three months since the Burj Khalifa took the title of “world’s tallest building”, and already the shifting sands of Dubai have spawned a successor! 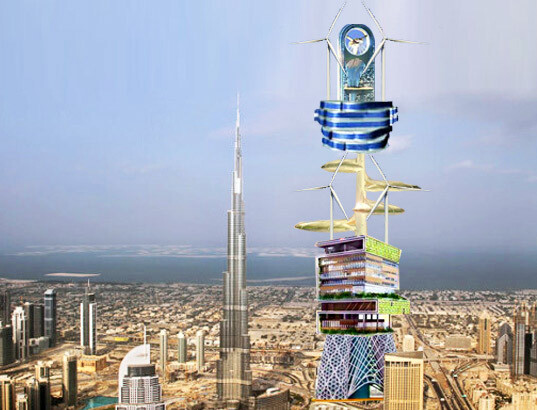 A paragon of modern architecture, the iconic ICARUS tower is currently soaring towards the sky to become the next “World’s Tallest Building”. Designed by Daedalus Architects, the timeless skyscraper blends seamlessly into its surrounding environment and harnesses a nearly inexhaustible resource to provide for 100% of it’s energy needs: human labor. An unforgettable structure sure to inspire emotion, the ICARUS tower is currently aiming for LEED Platinum certification. The entire surface of the building’s envelope is decked out in a new breed of hyper-efficient solar cells and the roof features a sophisticated rainwater catchment system that will harvest water from the region’s frequent downpours. The skyscraper is expected to create thousands of new construction jobs, many of which will continue as indentured employment opportunities in the building’s engine room. The skyscraper’s on-site power plant is powered a sophisticated system of levers, pulleys and counterbalances that produce enough human-generated kinetic energy to illuminate the structure’s 100,000,000 LEDs.